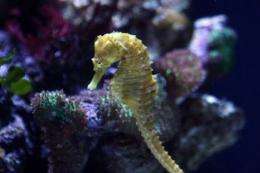 Evidence of a colony of rare seahorses has been discovered in the Thames, the Environment Agency said on Friday. Evidence of a colony of rare seahorses has been discovered in the Thames, during a routine fisheries survey at Greenwich, the Environment Agency said on Friday. This is the first time that these rare creatures have been found so far up the Thames and the first time in this part of London. The short-snouted seahorse (Hippocampus hippocampus), which grows up to 15cm (6 inches) is more commonly found in the waters of the Mediterranean and Canary Islands. Seahorses have often been a visitor to coastal waters around Britain but the agency said recent sightings suggest that there may be more permanent populations around the UK. Seahorses have elaborate courtship rituals and are one of the few animals that mate for life. Emma Barton, Environment Agency fisheries officer, said: "The seahorse we found was only 5cm (2 inches) long, a juvenile, suggesting that they may be breeding nearby. "This is a really good sign that seahorse populations are not only increasing but spreading to locations where they haven't been seen before. The last sighting of seahorses in the Thames was much further down the river in Dagenham in 2008. They have not seen since. The Thames has been reformed from a "biologically dead" river in the 1950s, as a result of sewage and industrial pollution, to a much cleaner waterway today. Barton added: "We hope that further improvements to water quality and habitat in the Thames will encourage more of these rare species to take up residence in the river." The agency said the seahorse was released back into the river. Now I also didn't expect to Wholesale cheap NBA Jerseys learn and fashion is all about, and character picture design. In fact still general a pronoun, in a word, is hair design, make up and dress collocation. I am liking all the beauty in the things that stylish definition is wide, not only on the outside dress sense. Also includes the wholesale cheap NFL hats self-discipline, life taste, the inherent quality and so on.